How do I delete multiple photos from Camera Roll without doing it one at a time? It’s really necessary to delete photos from iPad Camera Roll when you have taken massive photos, because these photos captures large space of your iPad. However, like the user mentioned above, you must realize that you can only delete Camera Roll photos on your iPad one by one. Therefore, it will be time-consuming and boring if you decide to remove one photo in Camera Roll at a time. Actually, instead of using this clumsy way, you have another choice. All your need is to download a program–Wondershare MobileGo for iOS or Wondershare MobileGo for iOS (Mac). It can handle it undoubtedly. With its help, you’re able to delete Camera Roll from iPad at once. No matter how many photos you have, you can erase all of them at a time. Download this free trial version and have a try. In the next section, we will explain you the detailed steps to delete plentiful photos from iPad Camera Roll at a time. Here, we just take the Windows version as an example. After downloading, you should install this iPad Camera Roll delete tool on your computer. Then, click Wondershare MobileGo for iOS.exe file on your computer to launch it. After that, plug the USB cable coming with your iPad into computer to connect your iPad with this program. Once you finishes, this iPad photo transfer will detect your iPad as soon as possible. 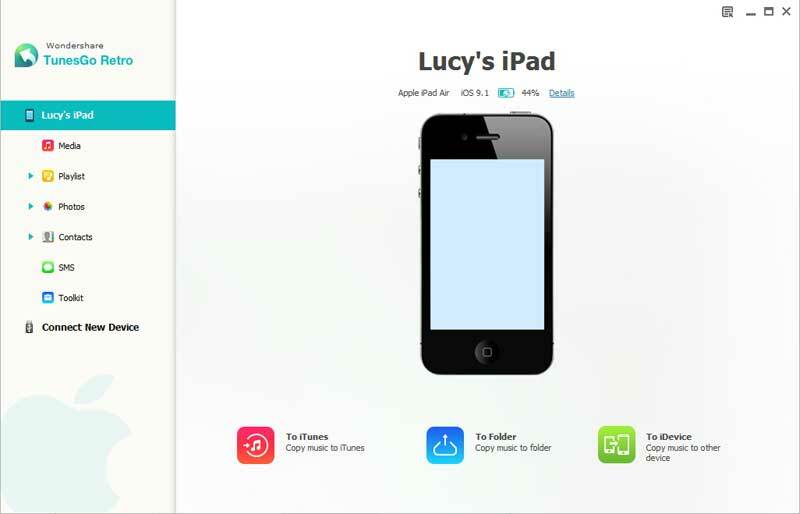 Then, your iPad will be displayed on the main interface. Note: Note: Before using MobileGo for iOS, you’d better download and install iTunes on your computer. Or, you can also install iTunes when you first launch MobileGo for iOS, because it will offer you the iTunes installation window at that time. Well, as you see, all contents on your iPad are shown on the left directory tree. To remove pictures in iPad Camera Roll, you should click "Photos" tab. 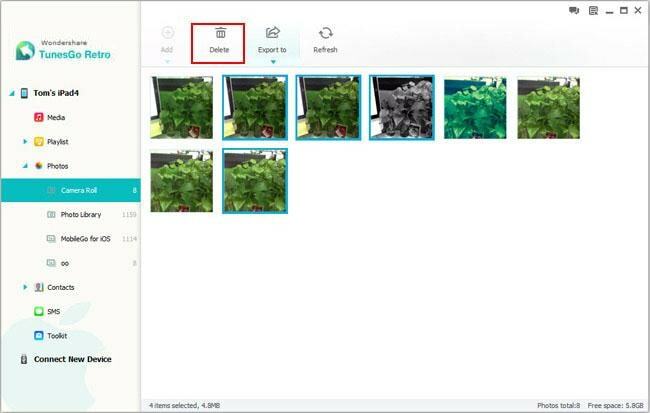 Then, the photo management window is displayed on the right side. Open Camera roll and choose photos that you intend to delete. Then, click "Delete". During the iPad Camera Roll deleting process, you ought to keep your iPad connected with computer. Note: MobileGo for iOS fully supports all iPads: iPad mini, iPad with Retina display, The New iPad, iPad 2 and iPad. Well done! You have managed to delete photos in your iPad Camera Roll. If you have lots of unwanted pictures in your Photo Library, MobileGo for iOS can help you remove all photos in Photo Library quickly as well.